Cape Town - New Zealand captain Brendon McCullum says South Africa's pace trio of Dale Steyn, Morné Morkel and Vernon Philander are just as good as the feared Australian line-up which dominated world cricket a few years back. McCullum's Kiwis were walloped by an innings and 27 runs in the first Test here at Newlands on Friday, with Philander, Steyn and Morkel claiming 16 of the 20 New Zealand wickets to fall. Man-of-the-match Philander finished with match figures of seven for 83, which included five for seven in the first innings to help skittle the Kiwis out for 45. 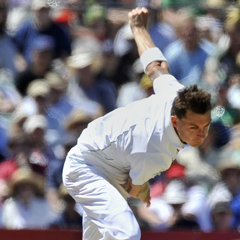 Steyn (5/85) and Morkel (4/64) also proved a handful for the New Zealanders. "Those three bowlers are as good as anyone I've played against - and they can definitely be mentioned in the same breath as the Australian attack of a few years ago," McCullum told Rapport, referring to Glenn McGrath, Brett Lee and Stuart Clark. "Back then the Aussies never gave you a chance to get yourself in as a batsman - and Steyn, Philander and Morkel have that same habit of keeping you under constant pressure. "I believe they are currently the best pace-attack on the planet by far." The second and final Test starts at St George's Park in Port Elizabeth on Friday. HAVE YOUR SAY: How strong do you rate South Africa's current pace trio of Dale Steyn, Morné Morkel and Vernon Philander. Are they right up there with the best in history or even the best of them all? Send your thoughts to Sport24.